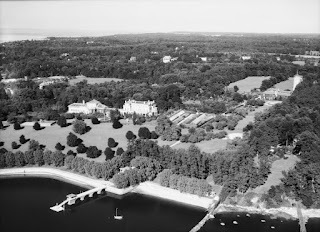 An aerial of 'Pembroke', the Joseph R. De Lamar estate designed by C.P.H. Gilbert c. 1916 in Glen Cove. Click HERE and HERE for more on 'Pembroke'. This aerial is part of SMU's Robert Yarnall Richie collection and was taken between 1932-1934. Winfield Hall in the background. ...and the house to the left would be the Howard Whitney property? This photo was originally tagged as the Richard Reynolds residence in the Richie collection. I had been contacted by SMU and notified them that Reynolds was in the background and this would have at the time been Loew. I think it would have been Richie that tagged the photo as Reynolds. HPHS- Yes, that's the Maxwell House to the left. Two Glen Cove houses that I don't think have been pin-ups on the site yet are the Whitney House (Howard Maxwell's sister)which would have been to the left of Maxwelton, and the Ayres' house, directly to the right of Pembroke which burned in the 1930's. Not that Zach needs any additional homework. Great photo, by the way, which hints at how rural much of the North Shore of Long Island still was. If one goes INTO the "Robert Yarnall Richie collection" aerial of Pembroke ~ click on the ROOF of the boathouse. The picture ENLARGES to show more detail. THEN if one clicks on the area BETWEEN the BASE of the great Pembroke Vase ( Zach's icon ) AND THE BASE OF THE FLAGPOLE TO ITS LEFT . . . at GROUND LEVEL, the picture ENLARGES yet again to give you the closest enlargement of the house, itself! One can only do this twice, per picture. This can be done on ANY AREA of any of the Richie aerials. Trial and error will give one the desired area one would prefer to display. Then one can save the image to your files. Ahhh Pembroke, just another great photo in a string or fantastic aerials posted lately. It is amazing to see how rural much of Nassau County was at the time, pre-WW II, in this and other previous aerial shots. As was mentioned when the Aiglon collection link was provided a few days ago, it would have been just remarkable to have the opportunity to view these estates from above in their primes with their formal gardens stretching in some cases for acres around the homes, vast expanses of lawns clipped to perfection, seemingly with nothing out of place. Love Winfield Hall peeking out above the tree line overlooking Pembrokes waterfront location, much coveted by Woolworth. The huge scale of Pembrokes conservatory still astounds. I don't know many Windows OS's this works in (or it may be a function of the Firefox browser)- I'm currently using a loaner from a repair shop with XP Home on it. Simply click on the photo in the post, when it comes up enlarged in the window hold the Ctrl key down while rolling your mouse roller forward or backward. The cursor doesn't even have to be over the photo. You can make it any size you want. There is a maximum size and it starts getting a little grainy in the upper sizings. This also works in Windows 7.
open it. I've never had a problem with any of the other links I attempted to open in the past. In the recent Forbes article "America's Most Beautiful Mansions" (that you can access from Gary Lawrence's MoGA blog)there is a picture labeled "Rough Point" that is actually Fairholme. Mislabeling continues.